Save $2,000 per couple off this cruise. Expires April 30. Click here for eligible departures. NOTE: The following information is from the 2020 tour season and is subject to change once the 2021 tour season information becomes available. ACTIVE Visit Angkor Wat, Angkor Thom, and Bayon Temple by bike. Enjoy some time at your leisure this afternoon to explore Siem Reap’s shops for local artisan crafts. CLASSIC Continue your Sightseeing Tour of the Angkor temples at Ta Prohm. Tree roots cover the ruin walls, allowing you to experience the temple with the same wonder as early explorers. Then visit Banteay Srei, a unique temple built on a small scale from red sandstone, which can be carved like wood. En route, stop at a village famous for making Khmer noodles by hand. Your Intimate Suite Ship® Awaits! Fly to Phnom Penh and transfer to the port where your ship’s crew will be waiting to welcome you onboard. Get acquainted with the ship and relax before your welcome reception this evening. DISCOVERY Visit Wat Hanchey, a hilltop temple dating back to the 8th century. Climb or be driven to the top where you will enjoy stunning views of the surrounding area and partake in a traditional water blessing given by local monks. DISCOVERY After lunch, enjoy a Walking Tour through the rural village of Angkor Ban. Here, you will visit a traditional Khmer house and interact with children at a local school. DISCOVERY Your Guided Sightseeing starts in Kampong Tralach with an Ox-Cart Ride through the beautiful Cambodian countryside. Along the way, stop to meet a local farmer and learn about his daily life. At the silversmith village in Konpong Louang, see talented craftsmen use age-old techniques to turn pure silver into works of art. 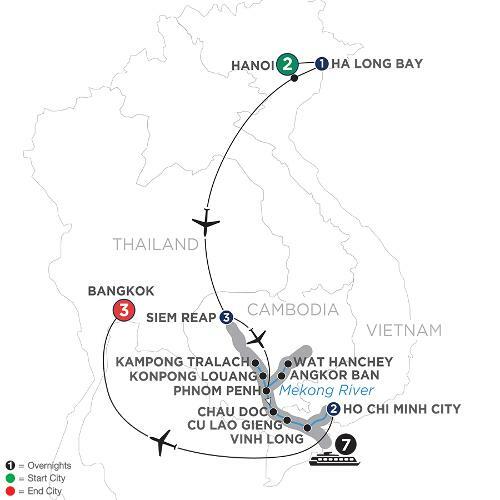 Sail to the capital city of Phnom Penh this afternoon. DISCOVERY Visit the lively Central Market with its unique Art Deco design by tuk-tuk. CLASSIC Join a Guided Tour of the city by private cyclo with visits to the Royal Palace with the spectacular Silver Pagoda, and the National Museum featuring an outstanding display of Khmer artifacts. The remainder of the day is yours to enjoy at your leisure. Consider a Guided Optional Tour of a local brewery with free-flowing local beer! Just before dinner, children from a local orphanage will perform a show, featuring local song and dance. DISCOVERY Take a Village Walk through the Chau Doc market, and absorb the atmosphere as locals are busy buying and selling fish, meat, and produce. After lunch, embark on a Guided Excursion down the backwaters of the Mekong. Along the way, see traditional floating homes, speedboat merchants, religious sites, a market selling dried goods, and more. DISCOVERY This morning, a sampan brings you to the village of Long Khanh A, for a Cotton-Weaving Demonstration of this well-preserved tradition. DISCOVERY This afternoon, enjoy scenes of daily life on Cu Lao Gieng Island via sampan and local motor cart. Your Guided Excursion starts with a stop at one of Vietnam’s oldest Catholic churches. Then, visit the home of a local family that makes Vietnamese conical hats, or “Non la,” from materials available to them such as palm leaves and bamboo. These iconic hats are primarily used as protection from the sun and rain but you may also see them used as a basket to carry home goods from the market. Lastly, visit a local workshop where a skilled family hand-crafts sampan boats. DISCOVERY Board a sampan this morning to Visit a Local Workshop in Vinh Long where you will see how rice paper, rice wine, and traditional candies are made. This afternoon, enjoy time on board the ship as we sail to exciting Ho Chi Minh City. CLASSIC Take a Walking Tour of Ho Chi Minh City’s historic landmarks, including a stop at the Rex Hotel for a refreshing drink at the rooftop bar where the U.S. Military held the infamous “Five O’Clock Follies” during the war. Then, visit the War Remnants Museum and bustling Ben Thanh Market. DISCOVERY For lunch, participate in a hands-on Vietnamese Cooking Class. Learn to prepare several local dishes and how to recreate them at home. Last, but not least, sample your delicious creations! CLASSIC Drive out of the city for a Guided Visit to the Cu Chi Tunnels—an extraordinary network of tunnels more than 120 miles in length—used as a hideout and secret village by the Viet Cong. Explore the city further during free time this afternoon. Day 16 HO CHI MINH CITY—BANGKOK, THAILAND. Continue your Southeast Asia cruise into Vietnam and visit a colorful market, the home of a local family making handcrafted sampans, and a workshop to learn how rice wine and traditional candies are made. In Ho Chi Minh City, see the famous landmarks and try your hand in the kitchen—Vietnamese-style, with a cooking class. On an excursion to the Cu Chi Tunnels, walk through a section of the immense underground tunnel system used during the Vietnam War. Your adventure ends in Bangkok, where you’ll visit its most renowned temples, including the Temple of the Reclining Buddha—the oldest and largest of its kind. The perfect way to conclude this unforgettable river cruise vacation! Participation in this vacation requires purchase of the following flights from Avalon Waterways, not included in pricing: (1) roundtrip air from your U.S. gateway and intra-vacation air segments; or (2) intra-vacation air segments only, starting at $610. Required intra-vacation air segments: Hanoi/Siem Reap; Siem Reap/Phnom Penh; Ho Chi Minh CIty/Bangkok. Air prices were effective on February 6, 2019 and their availability is limited. At the time you purchase your tour, air prices may be higher. Avalon offers the opportunity for solo travelers to sail with no single supplement (subject to availability). Please call for single accommodation details and prices. Triples not available. All prices are per person based on double room occupancy. Cruise price based on Category B in a Panorama Suite on Mekong Deck. To upgrade to a Category A on the Tonle Deck, add $400 per person in double occupancy or $800 in single occupancy. 2021 prices and itineraries are subject to change.